Bhringraj is an ancient ayurvedic herb for hair loss, premature graying, skin allergies, and devitalized skin and hair. It is a rejuvenative for Pitta constitution and also for the liver. Bhringraj balances all three doshas and is curative mainly for pitta. Taken internally, it purges the liver of bile and so is a trusted remedy for hepatitis, prevents ageing and helps rejuvenate bone and its subsidiary tissues, teeth and hair, improves sight and memory, and helps sharpen the intellect. Oil medicated with Bhringraj is used to keep Hair and Scalp healthy and prevents Hair loss and graying Hair. BHRINGRAJ is a preventative to the aging process which maintains and helps rejuvenate bones, teeth, hair, sight, hearing, and memory. It is a rejuvenative for Pitta constitution and for the liver; it is the best herb for cirrhosis. It is also the best Ayurvedic herb for the hair. Bhringraj oil is famous for making the hair black and luxuriant; for removing grayness and reversing balding. It helps calm the mind from excessive activity and promotes sound sleep. In many respects it is similar to brahmi, or gotu kola, in its properties. It combines the properties of a bitter tonic like dandelion (for which it is a substitute) with a rejuvenative tonic. Applied externally, it helps draw out poisons and reduces inflammation and swollen glands. It is a good tonic for the mind. Bhringraj also is good for the complexion.
? Made with 100% certified Organic Herb. 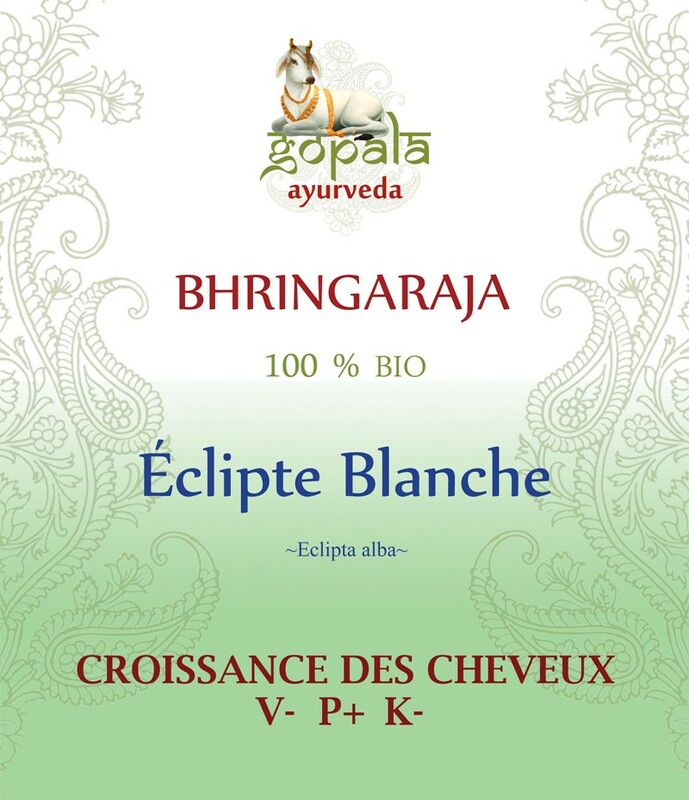 Description : Bhringaraja est une plante traditionnellement utilisée pour la chute des cheveux, et le blanchiment prématuré. Elle a aussi une action sur les peaux dévitalisées ou souffrant d’allergies. Elle a un pouvoir rajeunissant sur les constitutions Pitta mais aussi sur le foie.